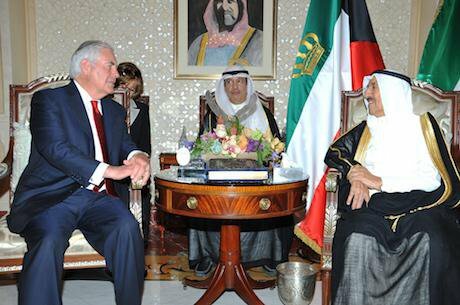 U.S. Secretary of State Rex Tillerson during a bilateral meeting with the Emir of Kuwait Sheikh Sabah al-Ahmed al-Jaber al-Sabah at Dar Salwa July 10, 2017 in Kuwait. Tillerson is meeting leaders of the Gulf Cooperation Council in an attempt to end the isolation of fellow member Qatar by a Saudi led coalition. State Department/Zuma Press/PA Images. All rights reserved.The Qatari crisis is no passing issue in the strategic alignment of forces in the Middle East with three main axes competing for regional hegemony. The three main axes in the region, led by Iran, Saudi Arabia and Turkey are likely to express their goals and interests differently, leading to increased competition and dispute. The main goal of each of the axes is the containment of the others, including the more-or-less non-aligned states such as Iraq. If the Qatari crisis is not managed rationally, then it is likely to compound the present risks in the regional balance of power, with consequences for all states in the region. The first of these axes consists of Iran and Syria, as well as non-state actors such as Hezbollah in Lebanon, the Houthis in Yemen, and forces affiliated with the Popular Mobilization Units in Iraq. Iran is the main directing and controlling force in this axis, supported politically, economically and militarily by the Russian Federation. The second axis consists of Saudi Arabia, Egypt, the United Arab Emirates, Bahrain and Yemen (under the leadership of Abed Rabbo Mansour Hadi), in addition to some non-state actors such as Jaysh al-Islam (Islamic Front). However, Saudi Arabia is the main force in this axis with Egypt as the second pillar. Unlike the prior group, this axis is supported by the United States of America. Although Turkey is a major regional power, leadership in its axis is rotated with Qatar as a result of a comparative advantage between each country in different aspects of leadership; Turkey with its military-human surplus is matched by Qatari finances to form the current integrated leadership structure. This axis is similar in many ways to the Saudi Arabia-Egypt bloc, as they are both supported by the United States and also part of the Sunni world of Islam. Although each of the three main axes in the Middle East have their own interests and goals, this has not stopped cooperation and engagement across blocs on certain issues. Recent examples of reciprocity have occurred primarily between the first axis (Iran) and the third (Turkey), notably facilitated by the increasing engagement of Russia with both parties on Middle East issues from Syria and the Kurds to economic relations. The Iranian - Turkish rapprochement, in particular, has figured prominently in many geopolitical issues yet to be resolved in the region, such as the fight against terrorism, the Kurdish Independence Referendum - just recently both Turkey and Iran warned against such a vote, and international efforts to ease the war in Syria. As for the Iranian - Qatari rapprochement, recent resolutions have covered interests from energy and military operations to foodstuffs, the most important being the management and sharing of the world’s largest gas field. Meanwhile, in the face of the Gulf Cooperation Council (GCC) blockade that banned Qatari planes from their airspace, Iran opened its maritime and airspace and also supplied food to Qatar. In both instances, the Iranian-Qatari rapprochement has had ramifications for the wider web of relations in the region. The recent warming of relations between Turkey - Qatar and Iran has highlighted the differences and contradictions between the goals of these two axes and that of Saudi Arabia. Despite mutual American support and common Islamic affiliation, both Saudi Arabia and Turkey have fundamentally different visions and objectives towards Qatar and Iran. The United States is particularly aware of the consequences of an exacerbation of the conflict between its primary partners in the region, Saudi Arabia and Turkey. American options are hamstrung in this quarrel among allies. To abandon Qatar in such a crisis would be damaging both for the loss of an important pillar in the Middle East and the opportunity it would provide to the Russians looking to reach warm waters. And the United States is aware that Qatar, with the help of Russia, Turkey and Iran, is capable of creating a gas monopoly with consequences for global economic growth. The bigger picture here is that an exacerbation of an inter-ally conflict could result in the disintegration of US-led alliance in the region into two discrete groups, one of them being (the Muslim brotherhood) with Qatari capital and Turkish manpower and the other (Wahhabi) with Saudi capital and Egyptian manpower. Given the US position, American policy planners are watching the events in the Gulf anxiously, particularly as it relates to Iraq. Managing the inter-ally Qatari crisis has therefore put the United States in a serious dilemma, since strong action in favor of either side must be weighed against repercussions for the 10,000 American personnel in Qatar’s Al Udeid Air Base, the largest US military base in the Middle East. Iraq is located in the middle of the three axes: Iran from the east, Saudi Arabia from the south-west, and Turkey from the north. In the face of competition and heated conflict between these axes, Iraq is in both a position of weakness and strength, with both threats and opportunities in consideration. The recent destruction of the country is at odds with its historic centrality to the region, making it both a prized possession and a vulnerable partner to each axis. All three axes are looking for influence in Iraq. And based on their collective geo-strategic perspectives, Iraq can function as both a crucial client state and buffer zone. In an interview with former Ambassador Alberto Fernandez, President of the Middle East Broadcasting Networks at Broadcasting Board of Governors, he outlined the needs of the Iraqi state in the near future. The reality is that there is a crucial window following the liberation of Mosul to consolidate gains and tighten control over Iraq. Competition for influence in Iraq threatens to carve the nation along sectarian, ideological, and material lines. The fragile national unity faces its greatest challenge if Saudi Arabia and Iran enter a zero sum game for influence. The brunt of their proxy war is likely to fall squarely on Iraq and its people. The US is concerned that Iran will go on the political offensive in Iraq. With the liberation of Mosul, Iran may well conclude that it no longer benefits from any US presence in Iraq. Iran has a vast array of means to exert pressure on the main Iraqi political decision makers, especially through its non-state actors. In addition, Iran’s strategic and historical relations with Shiite political forces gives it a foothold to direct the Iraqi people towards its own bloc. As for Saudi Arabia, the country has its own means of keeping Iraq from aligning too closely with Iran. The kingdom could passively refrain from supporting the reconstruction of the liberated areas, or actively support groups and parties intent on destabilizing the peace and impeding the political process in Iraq. More broadly, the Saudis may pressure other countries of the Arab and Islamic world against providing support to Iraq. Finally, Turkey also possesses the means of exerting pressure in the Iraqi political arena. The Ataturk Dam on the Euphrates River, one of the largest in the world, is owned by Turkey. Last year The New York Times reported on a story, “Turkish Dam Project Threatens to Submerge Thousands of Years of History,” that discussed the near completion of several Turkish dam projects, in particular the Ilisu Dam. The consequences for water levels in parts of Iraq appear to be significant, with marshes drying and the agricultural industry as a whole declining. Using water as a political card may play in Turkey’s favor with Iraq. Similarly, Turkey may use the Kurdish issue and its bloc’s ties with Massoud Barzani, President of the Iraqi Kurdistan Region, to its advantage vis-a-vis Iraq. Barzani's demands for independence may be pushed by both Qatar and Turkey. Although Turkey is opposed to Kurdish independence, this doesn’t rule out Erdogan’s willingness to use the possibility to pressure the Iraqi government. In addition, Dr Anwar Gargash pointed out in a speech at Chatham House that, “Just this year, the state of Qatar paid a ransom of approximately $1 billion to free a group of Qatari falconers in southern Iraq. Multiple sources confirmed to the Financial Times that $700 million was paid to the Iranian Revolutionary Guards and to the Shia militias which they control,” evidencing once more Qatar’s willingness to fund extremist groups in the region. The Qatari crisis, and the broader diplomatic imbroglio it has caused, has provided the impetus to the race for control of Iraq. Given the geopolitical value of Iraq and the opening presented to the various blocs in the region after the liberation of Mosul, competition for the future balance of power in the Middle East is already underway between Iran, Saudi Arabia, and Turkey.